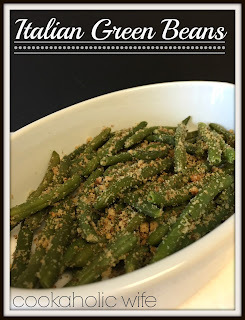 We eat so many green beans in this house. Tom isn’t a fan of most vegetables and because I have it in my head that he needs to eat them for dinner, I tend to cook the very few that he will eat and save the ones only I like for my lunches. There are only so many ways to prepare them but my no-thought go to is to saute them in butter and then add a bit of garlic and crushed red pepper. I was getting sick of eating them that way and turned to good old Pinterest to give me some new ideas. I saw this recipe and was sold! 1. Melt the butter in a large skillet. Add the bread crumbs, Parmesan, Italian seasoning and garlic and cook for 3-4 minutes, until the bread crumbs start to brown, stirring frequently. 3. 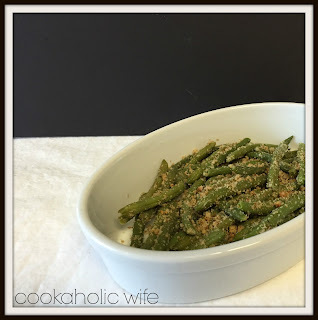 Stir the green beans into the skillet and season to taste with salt and pepper. Serve immediately. It’s such a simple recipe with ingredients most people keep in their fridge and pantry regularly. I couldn’t get over how delicious these were!